Superdry women’s Bleeker Hoodie. This premium quality hoodie is a comfort essential this season, it features a super soft brushed inner lining that is perfect for when the weather starts to get chilly. 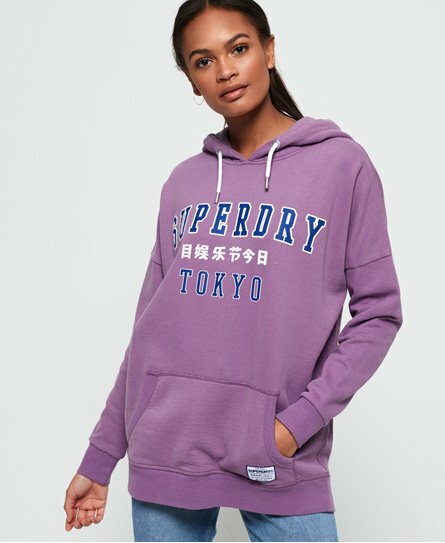 In addition, this hoodie has a draw cord hood, a Superdry logo across the chest and ribbed cuffs and hem for a comfortable finish. For the finishing touches, this practical hoodie has been completed with a large front pouch pocket to hold your phone and keys, as well as a Superdry patch on the pocket. For a key look this season, pair with hoodie with joggers for a laid back vibe, or pair it with jeans and trainers for an easy, everyday outfit.